The United States can be considered the melting pot of the world due to the country’s heritage that was carefully sculpted by immigrants of various backgrounds. It could be said that the American gastronomy shares a close resemblance to the history of its people. Travelling across the country prepare your tasting buds for the most varied dishes, New England’s Johnny cakes or its endless seafood dishes. The southern states are known for its home-style cooking with its fried-chicken and peach-berry cobblers. Southwestern states have a more spicy gastronomy with barbecue and chili based dishes, whereas the Pacific Northwest is famous for its king crab and pacific salmon, not to mention hunting. Finishing with California, the richest farmland in the US, as well as being the most diverse cultural state with dishes like sourdough bread, cioppino or typical Mexican dishes. The rolling hills with blooming orchards, vivid flowers and budding vines under blue skies topped with a mild weather all year round makes California the best wine region in the United States. 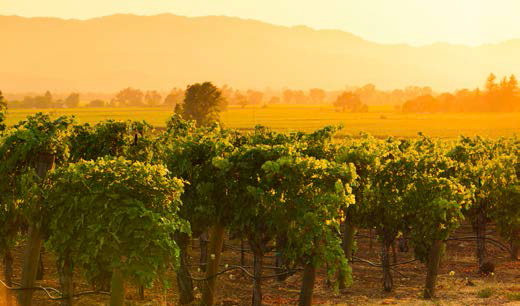 Napa and Sonoma valley are the most famous regions with divine wines that are neck-to-neck with the French wines.